Do you frequently get jumped on by your pet dog even when you are all dressed up and ready to go somewhere special? Does your dog greet your visitors with his big paws and a few friendly scratches when they enter your front door? While your dog may only want someone to play with, your dog jumping on other people may not entirely be a great scenario. Some may be okay with it, but there are also some who are not and that is why you need to do something about it. 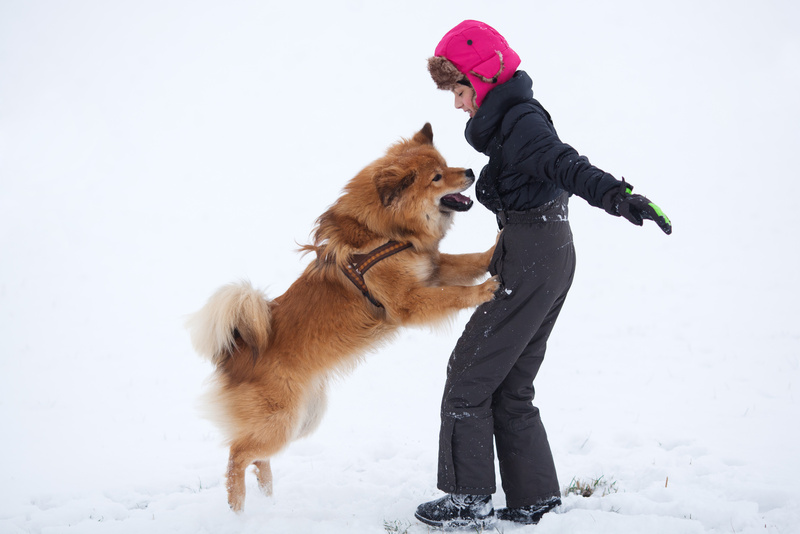 First, it is important to understand dogs’ behavior and why they jump up on people. One possible reason is that they are trying to reach our nose as their form of greeting. If you try to observe dogs, they usually greet each other by rubbing their noses. It is possible that they also want to do the same to us whenever they have not seen us for hours. And when they do, we usually react with affection because of our love for them. That is the first mistake. When you respond positively, you are giving out the wrong signals to your dog. When your dog jumps on you and you react by giving playful kisses, tickles, and belly rubs, your dog might think that you like what he did. He might think that it is okay for him to jump on people because by doing so, he will get the attention that he wants. The dog, which initially wanted to greet, will acquire a learned behaviour and that whenever he sees people, he will jump on them to get a positive reaction and possibly a belly rub or a pat and a treat. That is why, we should not encourage jumping, even when we find dogs, especially puppies, too cute to resist. We may find it endearing now, but it can become an annoyance and a nuisance once your cute little puppy grows into a full sized dog. It is important that your dog undergoes an obedience training so that his behavior around people can be corrected. If you want your dog to be trained by professionals and the best training experts, there are dog training centers, which focus on attention-based training classes to our beloved pets. One such center which specializes in obedience training is Sit Means Sit, which is one of the largest and one of the fastest growing pet training centers in the United States. They have more than 100 locations across the country and they are known for their training methods for dog behavior modification. If you choose to train your dog on your own, there are two important things that you should consider and these are management and training. As the pet owner, you are also considered as the leader of the pack so you must be able to manage and control any given situation and not give your dog an opportunity to jump on you or other people. One example of management is when you know that there are people coming over to your house, especially people who your dog is fond of seeing, you can prepare for the situation. One thing that you can do is to confine your dog so that he cannot jump on your visitors when they arrive and show unwanted behaviour. You can confine him in his crate or in a safe room. If you do not have an extra room in your house, you can also comfortably restrain him on a leash, at least for the time being. Aside from management, you also need to do training. You need to ensure that he will always be on his best behavior, whether in your presence or in the company of other people. Ignoring your dog once he jumps on you can give him the impression that he will only get attention from you once he stops jumping. Consistency is very important when training your dog. If you live with your family or with someone, they should also follow training rules and program all the time. There should be no exemptions or else, your dog will not learn and your efforts will be put to waste. If all else fails, seek professional help. Training experts would know what to do and they can correct your dog’s behavior with their effective practices. Remember that safety should still be the number one priority so training dogs to be on their best behavior at all times is a must for all responsible pet owners.